Morning: After breakfast, enjoy a three-hour introductory tour of Warsaw. 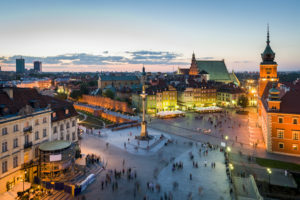 It will include limousine transfers and the very best of the city: the charming Old Town painstakingly rebuilt from scratch after WW II, the area of the former Jewish Ghetto, the busy downtown, the elegant Royal Route and Łazienki Royal Gardens. Evening: To conclude the day we shall invite you for the Chopin piano concert organized in the side wing of the Royal Castle. Morning: We’ll arrange transfer to the railway station, where you will board the express train to Kraków. The journey shouldn’t take more than 2,5 hours. In Kraków our local driver will welcome you at the arrival platform and transfer you to the hotel. 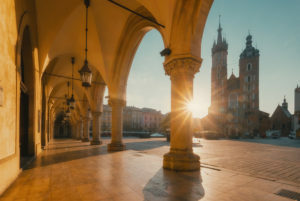 Afternoon: Meet one of the best local guide’s to explore the historic city, in particular the largest medieval square in Europe with the 16th-century Cloth Hall in its centre and the world’s largest Gothic altar in the splendid St. Mary’s Basilica. Also take some time to walk the cobblestone streets of the Old Town up the ceremonial route to Wawel Hill and the castle of the Polish monarchs. This comprehensive tour will take 4 hours. A full day private tour with your personal, English speaking driver who will take care of all the arrangements. Morning: We will explore Auschwitz which has unfortunately become a grim symbol of our civilization. Our tour will include the Holocaust Museum in Auschwitz I, as well as the less frequently visited Auschwitz II – Birkenau, the extermination camp itself. 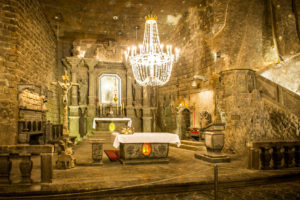 Afternoon: After visiting Auschwitz, you will travel to the Wieliczka Salt Mines, a fascinating monument of engineering which dates back to the 13th century. The subterranean universe comprises over 300 km of galleries hewn into the rock and salt deposits. Beautiful country, for the most part our guides were excellent. Accommodations in Warsaw were NOT 5 star, as requested. The tour was all I had hoped for and more! We loved Poland, the people and the sights. Wonderful. Just a shame I was by myself. Everything was well organized , Hotels were great and drivers and guides were marvellous. I thought the tour was great and very well coordinated. Everything worked great in terms of pick-up times, etc. The guide in Krakow (Barbara) wasn't great. While we were supposed to get a 4 hour tour, it was only 3. I was fine with it, though, because it seemed like she didn't want to be giving the tour anyway, and we preferred to do stuff on our own [...] Read full review at that point. Stay Poland, and especially Agniewska were extremely accommodating when we were planning our trip to Poland. Pricing was reasonable and tour guides spoke English well. Everything was super. We re-e-e-ally loved Poland. Beautiful place - full of history- totally welcoming and beautiful country. And you get a lot more bang for your buck here. The only problem we had was with the tour guides. The first one in Warsaw was a very sweet opinionated little old lady - too old to be acting as a tour guide. We could not hear anything that she was saying. The tour guide in Krakow was much better, at least we could hear and understand her. Unfortunately she seemed to be in a rush and we had no time [...] Read full review at all, even a few minutes, to take any pictures, which is a huge part of sightseeing. Some time should be added into the tour time to allow for some picture taking. The tour guides were experienced, the drivers polite and prompt. I would recommend this tour company. We were very happy with the planning, arrangements and itinerary worked out between Agnieska and us. All details were covered in advance, and she personalized parts of our tour to our needs, including a stop in the three small villages of our grandparents. Very prompt pick up and schedules kept well. Kraków was the highlight for us. We enjoyed all of our tours. Our tour guide for the Kraków excursions was a little quiet at first; he was providing transportation to our destination. But he was better on our second day for the Zakopne trip. Tour was very comprehensive...the guides were passionate and very well informed..could not ask for better English speaking guides. Top of the line. Very personalized service. Excellent tour. I would recommend to everyone. Well planned itinerary. Knowledgeable guides. On-time pick-ups by drivers. At conclusion of Wroclaw walking tour, guide left us unexpectedly at Cathedral to find our own way back. Great experience. We loved being in a small group and the personal attention. Hotels selected did not have restaurant. Thoroughly enjoyable, learnt a huge amount about the country. Staff were friendly, helpful and punctual. Would recommend to anyone. The tour was outstanding. Very personalized. The guides were knowledgeable and friendly.I have recommended Stay Poland Tours to anyone interested in visiting Poland. I have been on many tours but this private tour was honestly was worth my money and I'm so glad I did it. I loved everything about it and I have no complaints. I have been to over 25 countries but I'll put Poland as one of my top 3 places I have ever been, I truly loved every second of it and I believe how organised and the incredible service played [...] Read full review a huge part! I think I managed to see quite a bit of Poland with my short days there so I was really happy with that. I also loved the balance between guided tours and my own free time, I get to have free time by myself too and explore places by myself and eat by myself, which I really appreciated that. Just an incredible experience, thank you! A very educational trip. I would recommend the trip to others. Some days were very long with lots of walking. A stop for lunch would have enhanced the trip, but understand the logistics due to distances. Great overall, but the Salt Mine tour was far too overcrowded. We were with around 50 people and it even got out of range of the headsets from time to time. The private tour of Czestachowa was fabulous. We expected to see others in a group tour, of which we did meet by accident on day 3 but they were taken around separately by another driver. In any case, it was actually good to get one on one interaction with the tour guides and drivers. But we were a little disappointed not to meet up with other people on the tour. Good services. Nice hotels. Excellent cars and drivers. Excellent english of guides. We have really enjoyed this trip. The tour was excellently prepared. The guides were very knowledgeable. The drivers were punctual and very friendly. It was a great experience. The tour guides and drivers were all magnificent and the hotels were great !!!! The tours in Warsaw and Krakow were fantastic. Drivers were prompt and had great English skills. Guides were wonderful and well informed. Would prefer walking tour of Warsaw on morning of first day, then with some knowledge, I could make better use of afternoon. I very much liked the free time. Having two dinners organized was fine, and I very much liked it that I could choose the other nights. The train to Krakow was super comfortable. We had many different drivers and guides, all excellent [...] Read full review and helpful. The weather was miserable, bad luck for late May I think. For me the mix of organized and free time, and no large coachload of people, was perfect. Well organized. Saw all of the sights that we had planned in advance. Very well organised, made to feel 'safe' at every step of the way. Pleasant friendly tour guides and driver. Exceeded our expectations in visiting all the places we identified. The tour went off like clockwork, everything was exact, on time and your associates were friendly and helpful. We had 3 great tours with 3 super drivers and one guide (on the first tour). We enjoyed our interactions with all. This tour exceeded my wildest expectations. I was a little nervous about contracting thought the Internet but the continual feedback of responses by the tour advisor alleviated those concerns. Stay Poland was very helpful in tailoring our tour to include my special requests. Everything was seamless and the tour guide provided excellent assistance, a [...] Read full review wealth of knowledge and a worry-free experience. The tour covered all of the areas I researched beforehand. Excellent. Our tour was terrific. Our driver, Marek, went above and beyond to be helpful to everyone in our group. He was ALWAYS on time and a gentleman. We will ask for him the next time we come to Poland.